Heat oven to 425°F. Spray 16 mini muffin cups with cooking spray. Unroll pie crust onto work surface. Using 2 1/2-inch round cutter, cut 16 rounds from crust. Place 1 crust round in each muffin cup, pressing down gently to form cup. In medium bowl, beat cream cheese spread, salt, pepper and egg with electric mixer on medium speed until smooth. Divide mixture evenly among muffin cups, about 1 teaspoon each. Top each evenly with blue cheese. Bake 11 to 13 minutes or until edges are light golden brown. Cool 5 minutes; remove cups from pan. 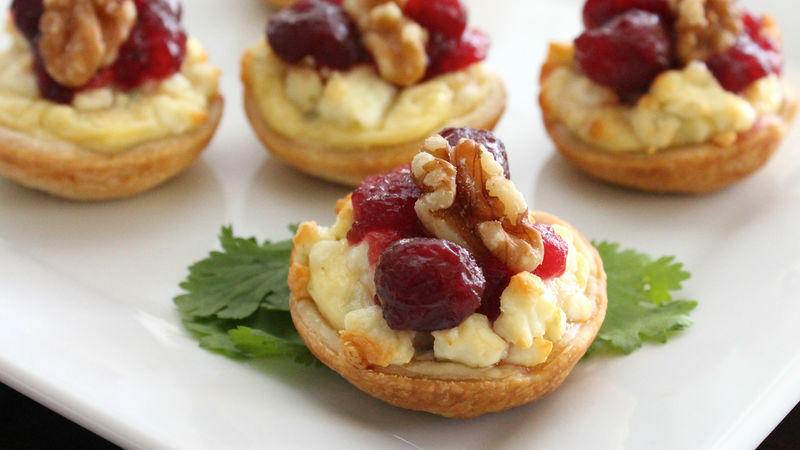 Garnish each mini cheesecake with 1/2 teaspoon cranberry sauce and 1 walnut piece. These mini cheesecakes can be served warm or cold. Store leftovers covered in the refrigerator. If you wish to serve them warm, they can be reheated in the microwave for about 30 seconds at a time until warm.